As soon as the MUA Nail Constellations were released a month or so ago, I hunted high and low in Superdrug stores to find one! I luckily managed to grab the last one in Windsor, which just so happened to be the Gemini ones, which were my preferred colour. MUA Nail Constellations are very similar to the Ciate Caviar nails, which retail for £18. These however, are only £3, so you don’t feel too guilty if you spill them everywhere (oops). The tiny beads have a gorgeous shine and the Gemini set are gorgeous shades of pastel pearly pink, blue, and purple. They are supplied in a funnel for easy application with a re-sealable top. 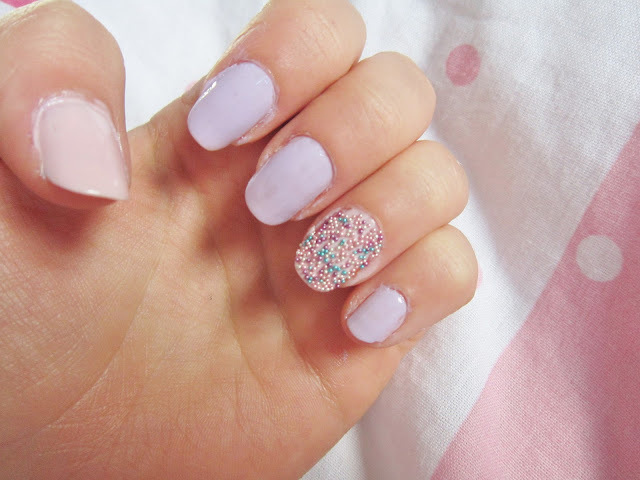 To use, you simply apply a coat of your nail polish, and then another coat which whilst still wet, you coat with the beads. You then just need to press them in a little bit, and they should set in place. I didn’t use a top coat when I applied them because the instructions on the bottle didn’t say too. However, the MUA website says to apply a generous coating of clear top coat to help them stay in place. Also, I used a brush on nail glue instead of nail polish, because I wanted them to be super secure on my night out! Available from MUA or Superdrug for £3. Once I picked off all the beads, it left this holey pattern which I actually think is pretty cool so I’ve left it like this! I like it! Have you tried these or Ciate Caviar? this looks SO good as an accent nail rather than a full set! i think it's a bit too much if you have a whole set of nails covered in these, but this works perfectly and it's so pretty. Your nails look so good! !